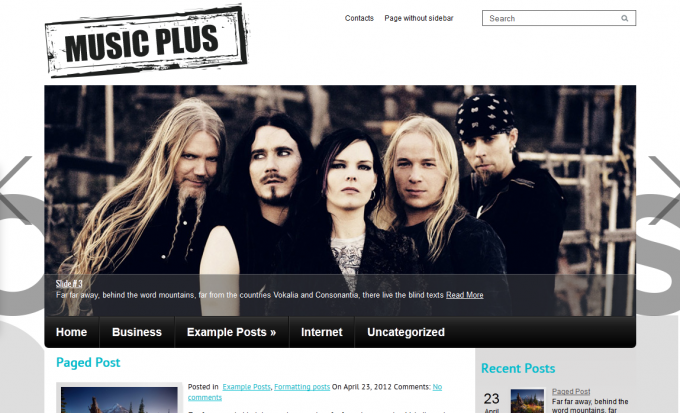 ‘MusicPlus’ is the WordPress theme that will inspire music fans to get busy and launch a marvelous blog on their favorite topic. This terrific theme has two sidebars, custom widgets, vertical menu, custom menus, multicolor related posts and much more. It captivates with a great layout and stylish design that will make every post stands out. ‘MusicPlus’ provides the possibility to create a great slideshow on the top of the page that gives a nice glimpse on everything fascinating that awaits your visitors. The theme has the full package of powerful and exciting features that enable you to launch unique and exceptional site, dedicated to music. Don’t miss out to share your masterpiece with as many visitors as you can via the social networks and with the help of the translation options to be available for multilingual audience. ‘MusicPlus’ is completely SEO optimized. It is built with a fluid design to be easy for browsing through from all kinds of devices, including smartphones, tablets and laptops.